Will Liverpool sale be jumping from the frying pan into the fire? Liverpool fans show their feelings towards the current American owners. News that the sale of Liverpool football club - one of the world's most successful and famous teams - had been agreed, in principle at least, was greeted with a sense of optimism by many of the legions of Reds' fans around the world. As one supporter from India stated on the team's official Facebook page: "It is excellent news after a lot of problems ... this new buyer can help us get back the glory after two decades!" Such reaction was no surprise. Any sniff of change from the doom-and-gloom which currently surrounds the once mighty team was always going to provide hope to followers of the Anfield outfit, as the tenure of current owners Tom Hicks and George Gillett has been an unmitigated disaster in the eyes of supporters. In taking over the reins in 2007, the Americans put the club in nearly $550m of debt in an instant. 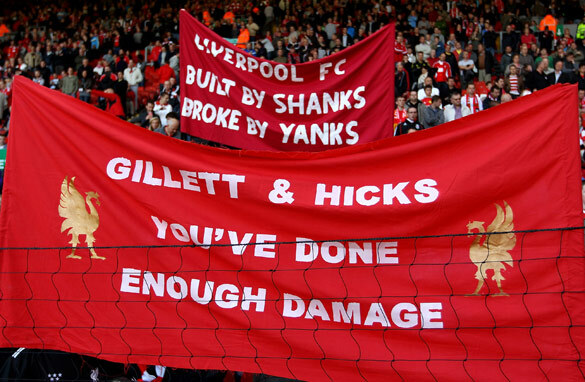 Subsequent unfulfilled promises of the building of a new stadium, disappointment in the transfer market and most recently a poor start to the season which sees Liverpool currently in the relegation zone means there is little love for Hicks and Gillett who have been blamed for the recent demise. Liverpool's quest for their first English league title since 1990 has seemingly no end in sight. The question remains, however, whether the New England Sports Venture (NESV) - another American-owned company who are behind the recently accepted bid - will provide any better direction? Could it be a case of out of the frying pan and into the fire? Is it a good thing that Liverpool may be sold to another American owner? The NESV - which is fronted by multimillionaire John W Henry - has pedigree in sport ownership and an impressive portfolio which includes the Boston Red Sox, Rousch Fenway Racing, the New England Sports Network (which carries the NHL's Boston Bruins) and the Fenway Sports Group. Henry can take much credit for the success Red Sox have enjoyed under his leadership. Since 2002, and after much investment, the Boston side ended a 86-year wait for the World Series title by becoming champions in both 2004 and 2007. Liverpool-born millionaire and former Atlanta Hawks owner Bernie Mullin told British broadcaster Sky Sports: "I don't think Liverpool have any other options. When you look at it from the John Henry and Boston Red Sox perspective, it's a fantastic investment. If they get it for a price below market value - as expected - it may mean they have more to spend on players. But I think it has been a lesson for American owners moving into the UK market, you have to build a bridge between the fans for it to work." "With the Red Sox he took over an iconic franchise and made it successful. He'll need to not saddle the club with debt and run it for long-term financial sustainability, that's what will be best for [Liverpool's] fans," Mullin added. The proposed bid for Liverpool would see the debt weighing on the club removed, and the timing of the deal would hopefully mean that funds could be made available for beleaguered manager Roy Hodgson to reinforce his squad in the European transfer window that runs throughout January. A new stadium is desperately needed for the Reds to compete with fellow Premier League big-boys Manchester United, Manchester City, Arsenal and reigning champions Chelsea. Hicks and Gillett promised a new arena but none materialized. It will be the task of Henry and the NESV to rebuild the trust between ticket-paying fnas and owners from the other side of the Atlantic. Liverpool's CEO, Michael Broughton, hailed the proposed move on Liverpool's official website. "By removing the burden of acquisition debt this offer allows us to focus on investment in the team," he said. Many fans will have their fingers crossed that if the deal goes through the new era will prove as successful as he hopes. Further complicating things is the falling out between Gillett and HIcks since embarking on this disaster together. Gillette is overextended having bought into NASCAR and the Montreal Canadiens. Can't say I'm overjoyed to see another american owner coming in after the last pair of crooks. But I hope I am proved wrong and wish Mr Henry all the best. As a diehard Boston Red Sox fan, and admirer of the EPL from afar, I can provide Liverpool fans with my take on John Henry and NESV. Since taking over the Red Sox in 2002, they have completely changed the culture of the team. For 86 years, the passionate Sox fans watched inept ownership field subpar teams. Within two years of owning the Sox, Henry, et al. brought home the first World Series Championship in most Sox' fans' lifetimes. They have completely overhauled Fenway Park and made the fan experience a high priority in the building. This has resulted in over 5 consecutive years of sell outs (81 games per year – a MLB record). Most importantly, they've invested in the product on the field. Through an intelligent approach to scouting and building from within, coupled with the willingness to spend on top free agents, the Red Sox have become a perennial powerhouse in Major League Baseball. Under Henry's watch, the Sox have made the playoffs (only 4 out of 14 teams make the playoffs), 6 out of 8 years. BTW, Tom Hicks has also run the Texas Rangers baseball club into the ground. This year, that team was finally wrested from his incompetent hands, and they're returning to the playoffs for the first time in forever. Should Henry run the Reds the same way, he runs the Red Sox, I should say that Liverpool fans should feel heartened that brighter times are on the way. As an American I am very happy that New England Sports Ventures is on the purchasing end of LFC. This will give us (Americans) a chance to redeem ourselves after H&G. LFC Chairman Broughton noted this as "...Hick's & Gillette's last chance to walk away from Anfield with their heads held high. They haven't taken it." These two have and had no reason for high heads after repeatedly blocking the sale and lying to it's supporters. How can a man with a fortune of only $800 million that part owns a group nevc that only has $ 1 billon dollars worth of assets afford to buy a club if its not with loans ? The whole deal stinks, M broughton lfc chairman i think is just looking to sell to anyone so he receives his 5% commission for the sale of the club, of course if he doesn't sell before deadline day 15/10/2010 before Rbs call in the loan saddled on the club he loses his commission that he would earn. The so called new owners will come in clear the debt then at a later date take another loan out saddler on the club again thats what hedge fund people do trust me it will be no different from what we have now mark my words. Its better if the club is auctioned off. A directionless piece doesn't really set out to answer it's own question of 'frying pan into fire'. Where is the insightful comment and opinion? Hope that the American businessman realize that running a football club (in Europe) is not like running a football franchise in America. You can't never move the team if the city refuse to build you a new stadium. It is not always about money. Pride, Loyalty and Culture play a huge role. These are smart people, I hope they will lean from the mistakes from others. This pompous football club and all its english hooligans need to be owned, and sold piece by piece exactly like a business and as is done in true LBO capitalistic fashion. Just like the brits did during their colonial past the world over. Good job Hicks and Gillet, own it and put it on the block like a piece of meat it is and sell it slice by slice for maximun profit. God bless Goldman Sachs of America and the Federal Reserve. How can the owner of a baseball team know what is needed with the Mighty Reds? Football is a totally different game. Football is a British sport not American! Not a good move in my book. A buyer should be sought from the hometown of Liverpool. YNWA. Well,i dont know much about the Red sox,but if they are goin to make a positive change in liverpoolfc,then should come and help out.i a pray God help them. I used to stay in the states for 4 & a half year & i'm aware of Red Sox's popularity. "Will Liverpool sale be jumping from the frying pan into fire?" as the title of this article said, i, as a die-hard Liverpool FC fan, am not hoping for it to happen. I personally disagree with the stereotyping of another American investor means another era of Hicks & Gillet. John Henry should be given a chance to prove to LFC fans that he'll fulfill all his promises ( building new stadium & ready money for future transfers) & bring this team back to glory, maybe not this year, but the next year & so on. I hope he'll put as much faith he's put in Red Sox into LFC. Though the acquisation has not been fully approved by EPL board, i would like to thanks John Henry for considering of putting an investment into LFC. I'm pretty sure with the history & fans we have, it's not a wrong investment. I hope to see a more glorious era. I am also a big fan of Liverpool FC,I wish Mr. Henry will bring good changes to LFC. Ideally, I think the fans should own the club, in the same way that some of the most successful clubs in Europe are owned. The main thing it would provide would be stability. However, I don't know how the figures would stack up, if the fans were asked to put their hands in their pockets. The American business model is a dangerous road to follow for European clubs, and can lead to the club's future being endangered. This type of investment is banned in Germany for example. Clubs there have to be owned locally and with no majority ownership. All English clubs (not just Liverpool) need a sound business model, and their debts reduced to realistic levels. It may mean a drop in their short-term performance, but will ensure their long-term health. The problem in England though is that short-term success is demanded at any cost. I don't think a American owner for LFC is a good idea, unless the Americans have millions to offfer Liverpool e.g. transfer market. Liverpool. Liverpool Football Club was not in debt until we were sold to the Americans. They brought their money issues to our club instead of keeping the promises they made before during and after purchase. They have ruined the most successful club in England. Hicks & Gillett need to leave our club so we can sort out the mess they put us in. They are typically arrogant & boastful. They are even suing LFC for $1 BILLION, WE DID NOT & DO NOT want them here. Only problem is we are going to be owned by more Americans. This could be the final nail in the coffin of a club, that has such a great history behind it. I think now the fans of liverpool w'l inhale after along ordeal,NESV i thnk they will help our club to be on sparklng.